EEDOnauts unite. Oklahoma City’s own Adam & Kizzie have kicked off 2014 with a bang. The pair has announced a series of live performances at various venues, affectionately dubbed EEDO Live 2014! These performances feature the EEDOnamic duo performing in intimate settings, interacting with their fans and blessing us with their uniquely beautiful gift of music. The first of these performances took place at Othello’s in Norman, Oklahoma on Saturday, January 11th. It was a special night for yours truly, due to the fact that I asked the lovely Jamie P. Green to be my wife at Othello’s before Adam & Kizzie performed. Adam & Kizzie even dedicated a song to us. The song was “You Cause My Sun to Shine”, which also happened to be the first song I ever heard them perform live, in 2012. I’ve been a true fan ever since. 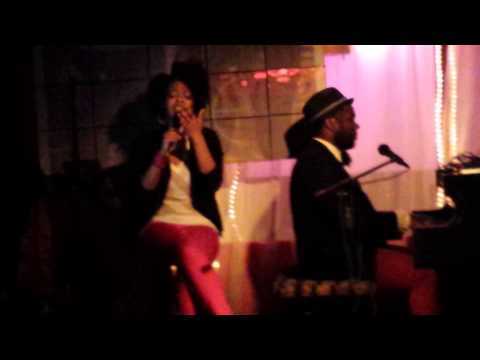 Adam & Kizzie EEDO Live! 2014 @ Othello's 1/11/14 – Oklahoma! For more information, visit http://www.adamandkizzie.com.